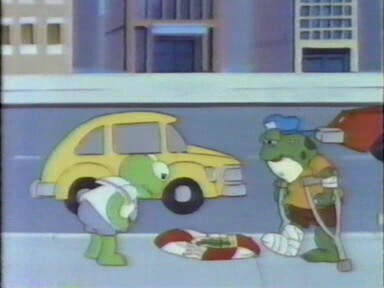 Muppet Babies, along with The Goonies, remains one of the mostly fondly remember parts of my childhood. They captured a child's ability to find excitement and adventure in the most mundane things, before the reality of adolescence and cynicism of teenagerdom crushed it all. It's not available on DVD, despite still being pretty damn good, probably because of licensing issues. It used tons and tons of footage from movies, a lot of Lucasfulm stuff in particular, and I'd imagine it'd be a pain to hash out the rights. Last week I found a torrent with all episodes and spent a good few days downloading all 18.6 GB of it. It was a great time remember old favorites, like the one where they enter Scooter's computer to track down a bug in a parody of Ghostbusters, or when they shrink down in size to cure Skeeter's cold a la The Incredible Journey, or even when they're doing relatively less exciting things, like assembling a newspaper. I didn't realize that the series was so long running though - there are over 100 episodes, and amongst them there's one called "It's Only Pretendo". I'd remember the series made some references to computer games before, but they were all made up. Here, they integrated a lot of actual gaming references, sometimes in surprising ways. 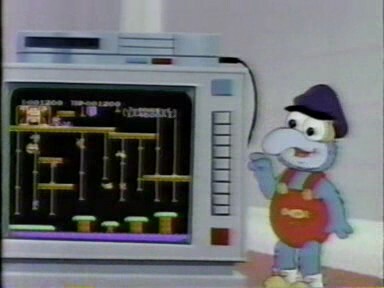 So, the basis of the plot is that Gonzo has a video game system and imagines himself in a ton of different games. Here's an obvious Donkey Kong homage, except with a dragon up top. 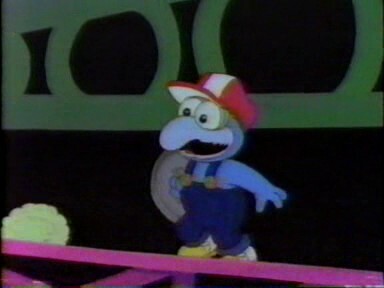 He imagines himself as Mario, as well. Ms. Piggie wants to play too. 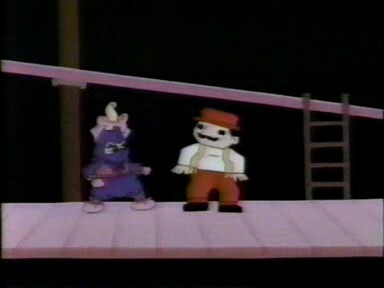 She grows frustrated as dumpy old Mario, though, and transforms herself into a ninja, kicking him offscreen. She turns out to be more skilled than Gonzo, however, who grows jealous and not only withholds important clues from her but fails to save her in a dangerous locations, passing her up for an opportunity for more points. 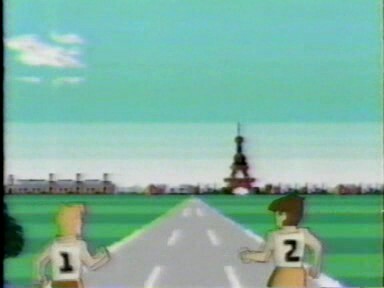 Most of the episode focuses on their adventures (with Animal along for the ride) with the others playing their own games. It's hard to tell from the screenshot, but this is supposed to be Fozzie getting bombarded by Tetris blocks. 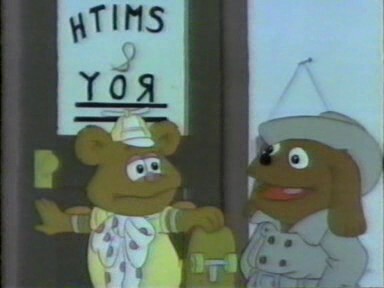 Fozzie then gets involved with some game called Skateboards of Doom, where he attracts the attention of these evil skateboarding ruffians who follow him throughout the episode. I don't think this is based on any particular game. Skate or Die, maybe? Or even Back to the Future? Probably not. 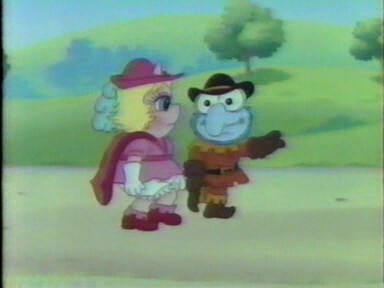 Gonzo and Piggie go medieval (kinda) for The Legend of Imelda: The Quest for the Golden Key. This overhead view is obviously taken from Zelda 2. The music is EXTREMELY similar to the underground theme from Super Mario Bros 2/Doki Doki Panic though. 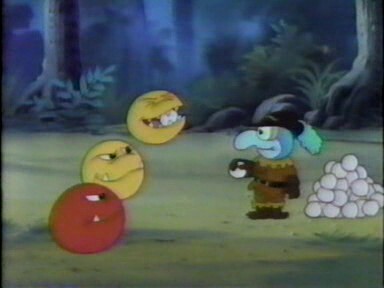 In the forest they encounter these weird ball things. Probably inspired by Pac Man, I guess. The Donkey Kong parody returns. This is where they do the musical number of the episode. 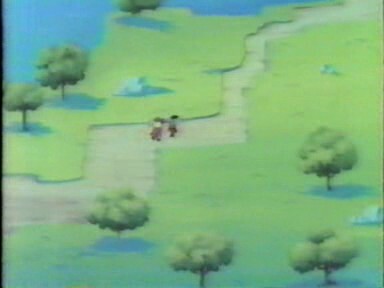 I love when they zoom out and show that their rendition of the game looks a LOT like Zelda 2. EDIT: Not actually! Apparently it's really just Keith Courage for the TG-16. That's even weirder! Scooter and Skeeter try out the equivalent of the Power Pad. Here's the Power Pad game. And them in the Power Pad game. They also note that even though they seem to be moving, they aren't making an visible progress. They also float forward even when they stop - was this how World Class Track Meet work, I've never actually played it. 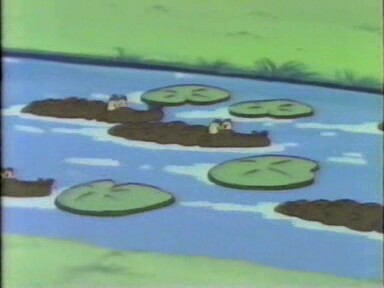 They're interrupted by Fozzie and the skateboarders that chase them. The only way for them to escape is to jump off the pad. This one is really surprising. Fantasy Zone? A Sega game? 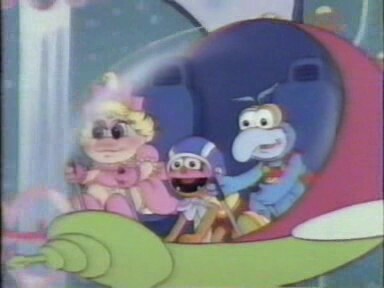 A close-up of the Opa Opa (obviously not referred to as such), piloted by the trio. Animal points at a bad guy. Looks accurately like the generator things from the game, too. 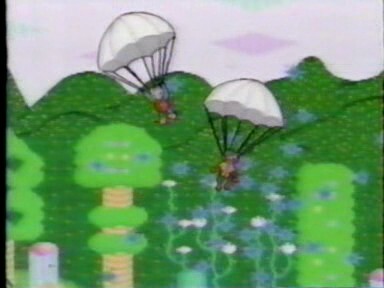 Gonzo and Animal parachute out after being destroyed, but he fails to tell Miss Piggie and she loses another life. 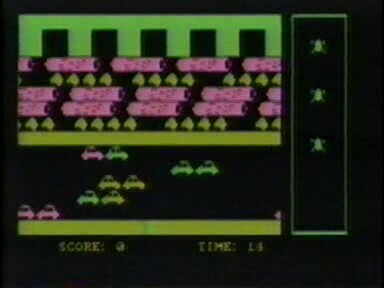 Yup, it's Frogger. You can probably see where this is going. 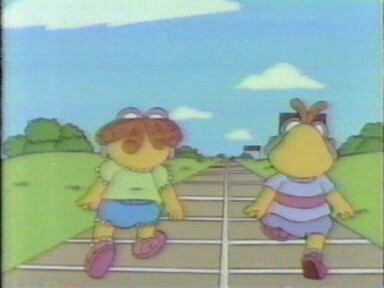 Kermit tries to cross the road, only to meet his forbearer, who's been having a tough time. Kermit solves the problem by dressing as a traffic officer and stopping traffic. That doesn't help the alligator river part, naturally. Rolf fashions himself as a detective. I don't think there are any games like that out there, except maybe Deja Vu, but I don't think that inspired this one. 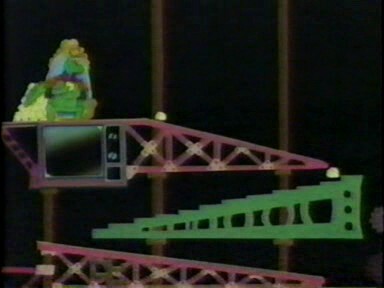 The episode then comes to a close, with Ms. Piggie as a ninja killing some weird bad guys. Lessons are learned as Gonzo and Piggie learn to play together, but then immediately fall apart as they argue over who "won". the part with Fonzie and the boxes looks sooooo familiar. I swear I saw this one. 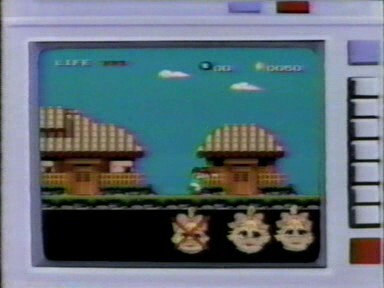 "I love when they zoom out and show that their rendition of the game looks a LOT like Zelda 2." That particular shot looks Keith Courage-like to me. 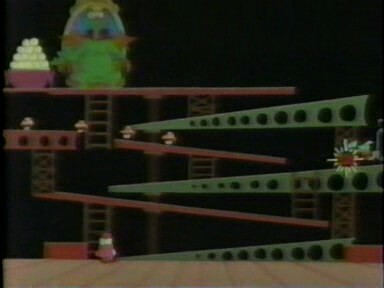 The screenshot with Fozzie and the boxes looks a lot like Q*Bert. I remember this episode and it was one of my favorites as well. 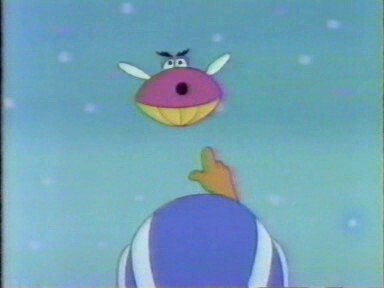 I had completely missed the Fantasy Zone and Keith Courage references as a kid. Now I'm wondering if "Smith & Roy" on the detective's door has some kind of hidden meaning. For what it's worth, I also enjoyed the episode with the Transformer look-alike, Transco Jobot. The Power Pad game (with runners 1 and 2) looks like Victory Run (TG16). 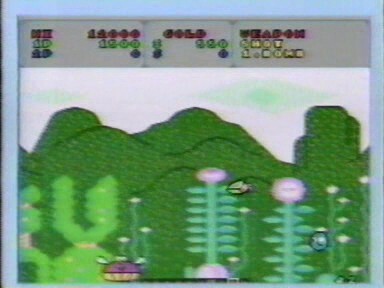 If Keith Courage is there, that Fantasy Zone might also be the TG16 version. 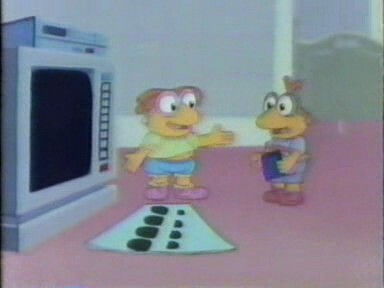 I remember the muppet babies! One of the better 'babies' spinoffs. Tom and Jerry kids, flintstone babies (or whatever) baby loony toons, Tiny toon adventures (i guess that counts?). pretty sure there's more in the whole 'baby version of popular cartoon' genre. "Smith & Roy" = "Sam & Max"? ... Naaaaaah. 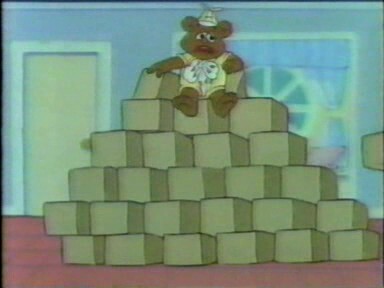 The part with Fozzie and the boxes is definitely supposed to be Tetris. He starts in the middle of a clear screen and boxes start falling down. He starts to panic and Scooter remarks about how you're supposed to line up all of the boxes together. Fozzie has no idea what's going on and the boxes just pile up, leaving him on top, which is what's pictured. At this point they switch to the Skateboards of Doom game and "save" him. Wow! I never knew there were TV writers who actually knew a thing or two about video games. I remember this show, and this episode in particular. Good times! Why no actual video? Youtube uploading isn't really very hard. I'd suggest the "Smith & Roy" thing may allude partly to Roy Allen Smith, who contributed to this series as producer.